BAHRAIN’S FinTech pioneers and start-up companies shone brightly at the largest technology show in the Middle East, Africa & South Asia alongside displays of all things weird and wonderful from the world of innovation. They picked up crucial business leads under the umbrella of the kingdom’s own pavilion erected with panache last week at Dubai World Trade Centre. 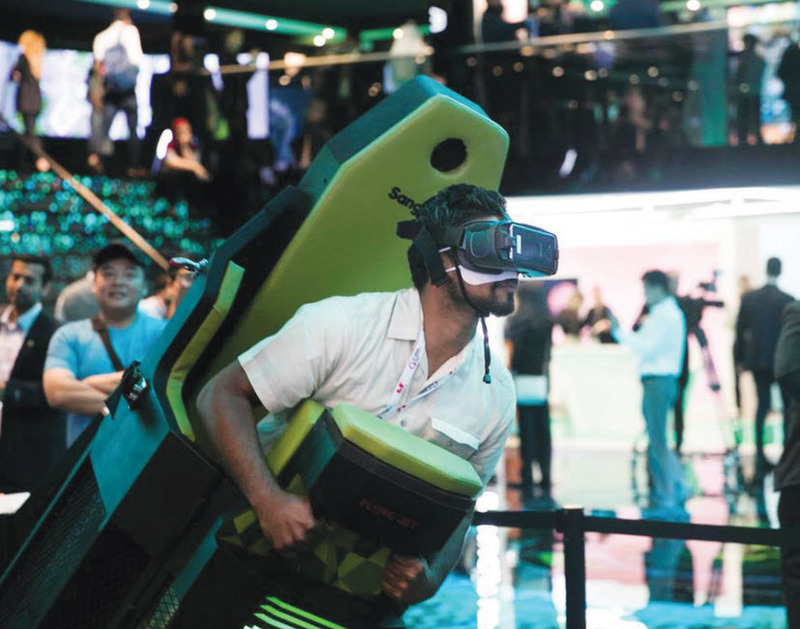 The 38th Gitex Technology Week showed off the latest in technology and offered a glimpse of the future with everything from flying cars to automated pizza delivery carts on display. Amongst the innovating companies flying the Bahrain flag was Payment International Enterprise (PIE) pioneers of cashless payment systems, risk management, compliance, banking and branchless banking. PIE’s CEO Fawaz Ghazal said: “Gitex is an international event where exhibitors find a space to showcase their latest technologies to an interested audience. It is the ultimate regional event where the newest technologies are presented … a sneak peak to the future. “It was important for PIE to be present at such an event, to showcase its newest technologies and to meet a new regional and international audience. The PIE team included Mahmood Al Hubaishi, project manager in the marketing and business development department, and Paul Sobrevilla, platform architect in the IT department. “We are very proud to be representing Bahrain in international events and very grateful for the support of our government in exposing local talent and companies to the rest of the world,” added Fawaz. Forty companies representing IT and telecommunications sector and 20 start-ups along with three government agencies took part at GITEX 2018. The participating government bodies included the Ministry of Transportation & Telecommunications, the E-Government Authority and Tamkeen. The Bahraini National Pavilion was inaugurated by the chief executive of Tamkeen, Dr Ebrahim Mohammed Janahi, who said the labour fund was eager to back the ICT sector by providing them with its full support to participate. It enabled them to ‘showcase their products and services and further expand their businesses, as well as enhance their competitiveness’. Ubaydli Ubaydli, chairman of Bahrain Technology Companies Society, said a rich programme of events within the pavilion proved ‘fruitful’ alongside visits to other national showcases and the event provided a favourable platform for participants to enter into fruitful deals. He added that the strong Bahraini presence at GITEX also provided an ‘unprecedented opportunity’ to assess the current status of the kingdom’s technology sector in comparison with others and to identify the challenges and opportunities needed for the advancement of the ICT sector. The competition to win hearts and minds was fierce. Mechanical arms from Yaskawa, a Japanese robotics company, were used to deliver mocktails via an automated robot bartender. Similar technology was used to demonstrate how prescription drugs can be dispensed from a robotic pharmacist, once a customer had accessed their account via a tablet device or smartphone. A mock-up hospital ward was also set up at the exhibition to show how doctors can perform surgical procedures remotely. Thanks to emerging 5G technology, haptic gloves that replicate a surgeon’s precision movements, via a robotic arm, can now perform minor operations from a distance. As reported in FinTech Focus, PIE has recently set up a partnership with the largest online food ordering platform in the Middle East, Talabat. Through its ‘TAM Here’ self-service payment kiosks located across Bahrain, PIE has developed a service allowing Talabat drivers to deposit the cash they collect from deliveries. It makes the cash collection process more efficient for Talabat and helps optimise its operations for more traceable cash deposits. This strategy will ultimately lead to a more measurable and seamless experience, the companies say. TAMKEEN’S chief executive Dr Ibrahim Mohammed Janahi honoured the Bahrain Technology Award winners at a ceremony held on the sidelines of the Bahrain National Pavilion at GITEX. The award ceremony took place in the presence of Bahraini institutions, Gulf and global decision-makers in the ICT sector, government officials, business owners, entrepreneurs, as well as GITEX participants. The Bahrain Technology Award was presented to five IT companies – CTM360, FAME, Syskode, Microcenter and Al Amthal, and five Bahraini start-ups – Nakheel, Nabdaa, Equalibria, TimecTechnologies and Snapcomms were also honoured. At the regional and global level, eight companies – Skolera, Centra Hub, InfoWatch, Embarc, Ultimit, Avanza Innovations, Cognitive Pilot, The Shipping Spot and Rology – picked up prizes.